The transfer of Zola's ashes to the temple of "Les Grands hommes de la patrie� occasioned this special issue of L'Assiette au beurre (No. 374, 30 mai, 1908) with illustrations by d'Ostoya. 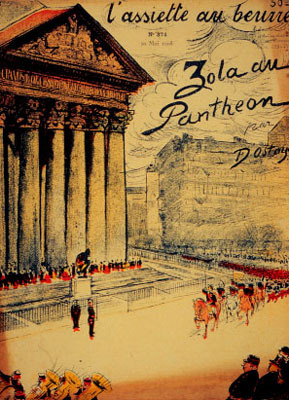 "Zola au Panthéon� is a virulent denunciation of official hypocrisy. A long, snaking line of dignitaries (depicted with great kinetic energy by d'Ostoya) on each page wait to make a public show of their "respect." The captions, however, show that members of the government, the army and the clergy think quite differently of the author of J'accuse than their presence on line might lead one to believe. In the lllustration shown on the top of page 4, graduates of the religious and military schools recall how they were sent out weekly during the Dreyfus Affair to shout out "A bas Zola!" While, at the bottom of page 4, standing outside the line, but feeling he has a place in it, "because I gave a hundred francs for his monument," we see the instantly recognizable silhouette of Alfred Dreyfus himself. Of special note is the cover illustration (page 1) where d'Ostoya seems to have applied Zola's own naturalistic conventions (and perhaps an allusion to the nascent cinema as well?) in his long-shot take of the procession wending its way to the Pantheon.